Geneva, Switzerland — The United States and Iran reached an historic agreement Sunday, the major pillars of which are an agreement by Iran not to mock the odd-looking face of U.S. Secretary of State John Kerry, in exchange for an easing of sanctions imposed on Iran by the United States and the European Union. Mr. Kerry’s face, and what may or may not have been done to it, has been the subject of a great a deal of debate and rumor-mongering in and around Washingon, D.C. 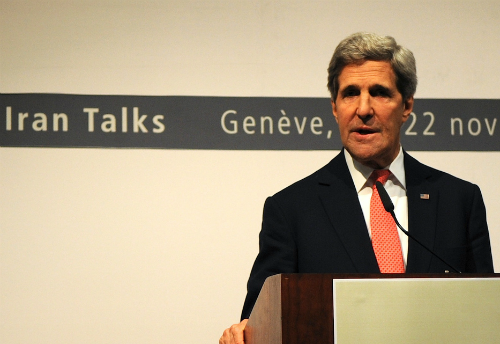 Many Washington insiders are certain Mr. Kerry has undergone plastic surgery, which he vehemently denies. As far as how complete the ban on mocking Mr. Kerry’s face will be in reality, that appears to be the subject of some disagreement between the parties involved in the Geneva accord. Iranian Foreign Minister Mohammad Javad Zarif, while agreeing that the deal was historic, assured the worldwide press that the deal secures Iran’s ability to mock the faces of U.S. diplomats in the future, provided it is only done for humorous purposes. President Obama addressed the nation Sunday to praise the negotiators and the spirit of cooperation.